Welcome to DYbaby jewelry! We hope you have a great shopping experience in our store! We are doing our best to design and make wonderful kinds of jewelry to suit you and make every one of you very special among the throng! We are specializing in jewelry making. If you like this product, we advise you add it to wish list now, so that we will inform you immediately once it has a discount. And you can click our brand name which on the top of the title, you will find more jewelry with high quality and reasonable price. Made of 316L high quality stainless steel, no distortion, no damp, no rust! Refer to the last picture to get product size and details information. 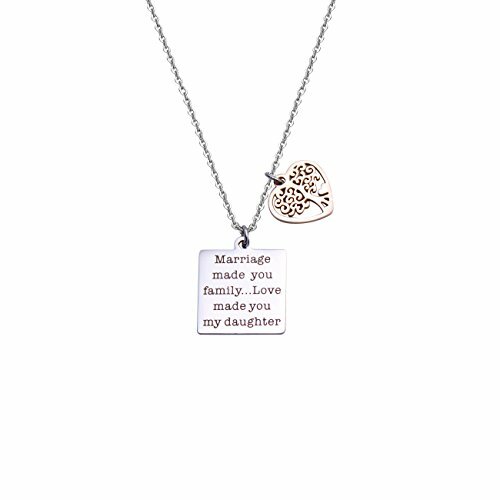 Lovely gifts for stepdaughter and daughter in law! Show her how much your love is! Packed in a beautiful velvet jewelry gift bag and ready for giving! If you have any questions about this product by DYbaby, contact us by completing and submitting the form below. If you are looking for a specif part number, please include it with your message.